Bacteria found in caves could provide the clues to help produce antibiotics needed in the fight against drug-resistant superbugs, explains Prof Hazel Barton. When you think about caves, your first thoughts might not include microbes and antibiotics, but these isolated and starved environments may hold the key to better understanding our long battle with drug resistant bacteria. Antibiotics are chemical keys, constructed to fit the molecular locks necessary to kill bacteria. They mimic cellular patterns to block, bind and even collapse critical structures within the cell. As a result, the bacterium is unable to function, falls apart, or dies. Antibiotics are also remarkably specific, able to find and target one bacterial cell in a sea of human cells, without misfiring - the magic bullet which became the most important medical discovery of the 20th century. Chemically, antibiotics are much more complex than anti-cancer or anti-viral drugs, looking more like a spider's web with their intricate patterns of chemical bonds. This complex structure make them almost impossible for chemists to design or synthesize, which is why we often turn to nature for their discovery. Of the myriad of antibiotics that have come on the market over the last 60 years, 99% are derived from other microorganisms, primarily bacteria and fungi in the soil. But this source of compounds is starting to run out and we must turn our attention to more exotic and extreme environments. Caves are isolated environments, formed by water eroding rock over millions of years. In such isolation, without the input of sunlight or nutrients from the surface, microorganisms have had to adapt to a life of perpetual famine. Through my work in caves, I have learnt that such microbes are so well adapted to starvation, that regular laboratory growth conditions are too rich. With many of these microorganisms trapped in an unending search for food, they are unable to turn off their scavenging systems, and stuff themselves to the point of death. Others are so adept at making a living from what little energy is available that they can survive by eating the plasticizers that leach out of plastics in our laboratory dishes. Some cheat, learning to hunt down and prey upon other bacteria to obtain the resources they need to survive. Of the over 4,000 bacterial species we have grown from cave environments - 1,000 of which are new species - most behave unlike their surface counterparts. What makes these bacteria unique also makes them ideal targets for the discovery of new antibiotics. In collaboration with Brian Bachmann at Vanderbilt University, we screened some of these samples for new antimicrobial compounds. A single one of our samples produced 38 antimicrobial compounds, including what appears to be a novel antibiotic. To put this into perspective, there are less than 100 antibiotics that have ever been described, and a single isolate from a cave produced almost a third as many. So what makes the bacteria in these caves so rich in antibiotic potential? The answer probably lies in isolation. These bacteria were collected from a deep and isolated cave. Lechuguilla Cave, in New Mexico, USA, is a deep cave, formed over four million years ago by the action of sulphuric acid from groundwater. 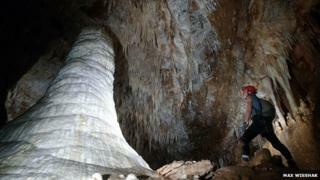 The cave averages over 1,200 feet in depth and requires abseiling down a dozen ropes to access sample sites. Indeed, sampling often occurs in areas so remote that we have to camp underground for days at a time. This remoteness also means that these bacteria have not been disturbed, and it is possible to collect samples from areas that have been undisturbed by any kind of activity for millions of years. Without outside influences, microbial communities in these environments can continue to evolve in isolation - developing novel solutions to the problems that plague their soil counterparts, such as competition and the desire to fight for resources. The cave environment is a tough place in which to make a living, limited in food and essential nutrients, forcing microorganisms to fight over limited resources. However, given their small size (two million of them would be needed to cover a semi-colon) their options are limited - no teeth to grab, no claws for fighting. Instead microbes use their remarkable biosynthetic capabilities to synthesize antibiotics and kill the competition. To examine the extent to which these bacteria could be exposed to antibiotics, along with Gerry Wright at McMaster University, Canada, we examined 93 of our 4,000 bacterial isolates. Despite the fact that these organisms were isolated for millions of years, and could never have been exposed to man-made antibiotics, they were resistant to virtually all the antibiotics that are currently in use. Just as some of our isolates produce a multitude of antibiotics, some were resistant to a multitude as well - one isolate was resistant to 14 different antibiotics alone. We even identified a mechanism of antibiotic resistance that hasn't been seen before. So, what does this all mean? Does it mean that whatever we try, we'll never win the us-against-them battle with the microbes? It can mean many things, and it is likely that we'll spend years exploring and answering those questions. It does mean that antibiotic resistance is hard-wired into bacteria - while changing our behaviour in the prescription and misuse of antibiotics, we are never going to defeat them. It also means that there are unique, under-explored environments, populated by microorganisms that we're only now just beginning to understand, that hold the key to new drugs. Finding them also requires new and under-utilised techniques, including genome screening to identify the complicated chemical pathways of novel drugs and new technologies in analytical chemistry that allow us to detect minute levels of novel compounds, as well as those who are willing to venture into the hidden, unique environments of our planet and unlock its microbial secrets.